The Eighth Judicial District Commission on Judicial Performance unanimously recommends that Judge Thomas R. French BE RETAINED. Judge French was appointed to the District Court in 2011. Prior to his appointment he was in private legal practice for 29 years in Fort Collins with a mixed practice of civil and criminal law. Prior to his private practice in Fort Collins, he served as a deputy and chief deputy district attorney in Denver from 1978 to 1982. 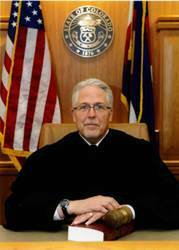 Judge French graduated from Colorado State University in 1971 and received his Juris Doctor from the University of Colorado in 1977. Judge French keeps current with the law by teaching. He teaches 30 to 60 hours each year for NITA, a non-profit organization dedicated to improving the level of trial advocacy in our country. He also teaches continuing legal education courses. Judge French also is active in community service activities. He and his wife speak many times, every year, to nursing classes at Front Range Community College and the University of Northern Colorado about their experiences as the parents of a child with disabilities. They have also spoken to college ethics classes, campus ministries, community service organizations, and classes sponsored by the State of Colorado for parents of children with disabilities. The Commission was impressed with Judge French’s performance in all aspects of the evaluation criteria, including his proactive approach to professional improvement, and believes that he will continue to be an excellent judge.